I call this “Ode to Wine Country” because it’s a beautiful salad of arugula and spinach, figs poached in Moscato, globe grapes, walnuts, chicken and a Moscato dressing with a hint of rosemary. These are the some of the flavors found in wine country. This salad comes together in about 10 minutes but tastes like a salad you’d get in an upscale restaurant. It is healthy and practically effortless. Salad can get boring after awhile, but this one will keep us coming back for more. Tip: If you don’t regularly drink Moscato, buy one of the airplane-size bottles for the recipe. Place Moscato in a small pot and turn the heat on to medium. While it heats, slice figs in half and set aside. Next, divide the greens between two plates. Rinse the grapes off and slice in half. Divide the grapes and walnuts evenly between the plates. Next, chop the onion and chicken and divide that between the plates. By now, your Moscato should be bubbling. Add the figs and poach for 3 minutes. Remove figs immediately, but reserve the Moscato liquid. In a bowl, whisk together the olive oil, balsamic vinegar, 6 tablespoons of the Moscato liquid, rosemary and honey. Pour over salad and toss thoroughly. If desired, add goat cheese. This entry was posted in Salad and tagged delicious, easy, figs grapes, goat cheese, healthy, light, low fat, m spinach, moscato, quick, rosemary, rotisserie chicken, salad, wine country on September 30, 2015 by Juliana Goodwin. I love salsa. Fruit salsa. Smokey salsa. Charred salsa. Jarred salsa. Green salsa. You name it, I love it. 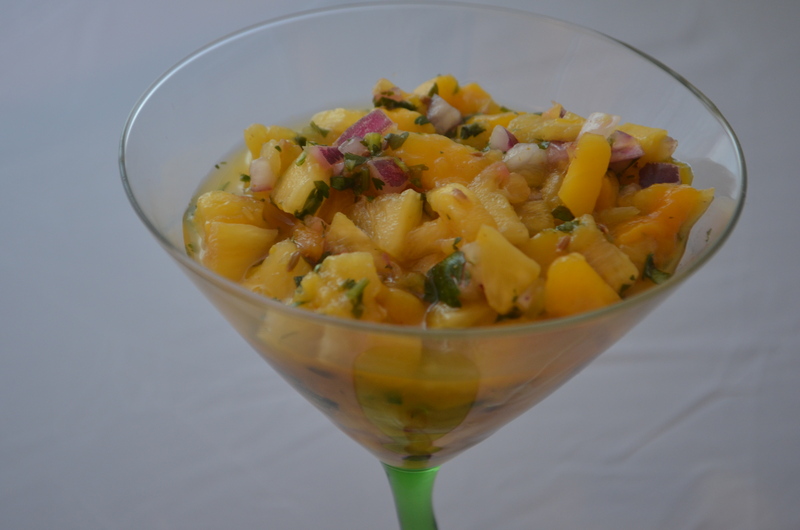 But I particularly love this Mango, Pineapple Salsa. One of my best friends makes a similar salsa and this is my version. My salsa won “Best Overall Salsa” at a friendly competition and it was up against an array of excellent salsas. Aside from being delicious served on its own, this salsa is great on grilled fish or pork. I recently marinated pork chops for 24 hours in Soy Vay Veri Veri Teriyaki sauce (online) http://www.soyvay.com/flavors/veri-veri-teriyaki) and then pan fried the pork and topped it with the leftover salsa. It was fantastic! If you don’t have that sauce, use soy sauce, ginger, 1 teaspoon canola oil, 1 teaspoon rice wine vinegar and 1/2 a garlic clove for 3-4 pork chops. That makes a nice marinade. A pork loin marinated in Asian sauce, grilled and then served with this salsa would be spectacular. This would also be great on chicken or fish tacos. The key to this salsa is ripe, sweet fruit. Mangoes are hardly ever ripe when you buy them, so I buy them 3-4 days before I need to make this salsa. I also buy extras in case some are not sweet. Whenever I have to use avocados or mangoes I buy extra because you’ll often get a disappointing one in the batch. I bought 5 mangoes to be safe. There were all sweet, so I ate the others for breakfast. If you can’t find ripe mangoes, you can use the jarred refrigerated type, but fresh is always best! I like to serve it in a margarita or martini glass for nice presentation. It’s such a refreshing salsa for summer. I adore it! Chop all the ingredients and place in a medium bowl. Add salt to taste. Toss and refrigerate at least 2 hours before serving. 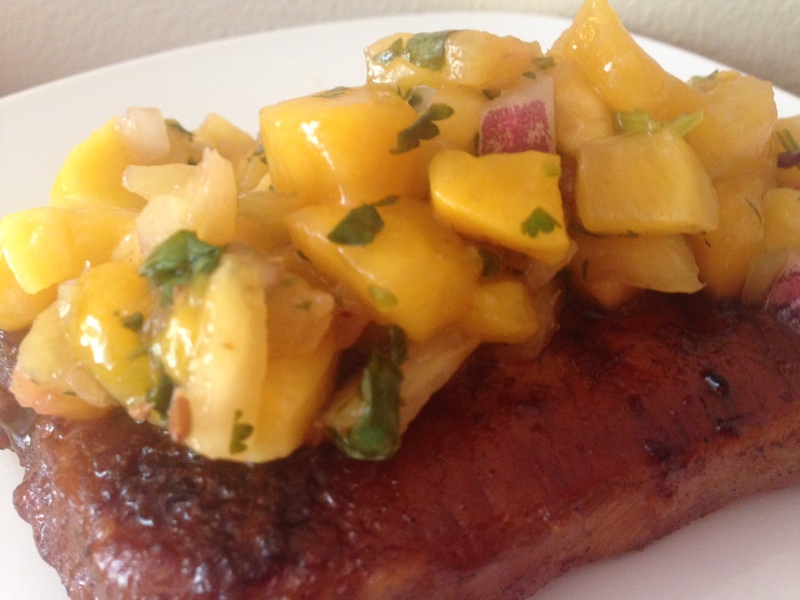 This entry was posted in Appetizers, Healthy Recipes, Juliana's Favorites and tagged Appetizer, chicken, cilantro, cumin, Entertaining, fish, grille fish, healthy, leftovers, light, mango, Party, pineapple, pork, red onion, refreshing, salsa, summer, tacos on August 12, 2015 by Juliana Goodwin. I must say, I chose the wrong color of bowl to showcase this delicious salad. I was STARVING when I made this and all I wanted to do was photograph it so I could gobble it up. I rushed and it didn’t pay off in terms of my photo. If I had just swapped out a white bowl for the green, this salad would look more appealing. Let me tell you, it’s DELICIOUS, HEALTHY and very LIGHT. It’s perfect when it’s hot outside. My husband and I both commented on how good we felt after we ate this salad and how long that feeling lasted. We are both trying to shed a few pounds, so I will likely be posting more healthier food options. Don’t worry, for you junk food lovers there will be plenty of indulgence, too. This salad gets protein from the chicken and edamame; fiber from the apples, lettuce, and Napa cabbage. The ginger dressing is light and refreshing. And then there’s the flavor punch from the cilantro and green onions. Yummy! I love it and I hope you enjoy it, too. If you do, please share it. For the dressing, whisk all ingredients together in a glass bowl and set aside. For the salad, chop all the vegetables and place in a large serving bowl or divide between two bowls or plates. Remove chicken breast and pull off the skin. Chop the meat into desired pieces and place on top of vegetables. Toss with the dressing. Allow it to rest for 5 minutes before serving. This entry was posted in Main Courses, Salad and tagged asian, cilantro, delicious, easy, edamame, fast, ginger, granny smith apples, green onion, healthy, homemade dressing, light, lunch, napa cabbage, rotisserie chicken, salad, serves two on July 20, 2015 by Juliana Goodwin. Sometimes memories are so vivid you feel like you can taste them. That’s how I feel about the sweet taste of corn on the cob fresh my grandparents’ farm. My family would visit every summer. Grandpa would harvest corn in late July into August and I’d help my grandma shuck it for dinner. She always boiled it and served it so hot that a slab of butter would melt and slide down the side of the cob the second the butter touched it. I couldn’t wait to nibble off the golden kernels in horizontal rows. It was a delicious tradition and a wonderful memory. I still love corn on the cob although nothing compares to the flavor of farm fresh corn. For starters, corn is best consumed the day it’s picked because within 24 hours of picking, the sugars start to convert to starch and some of the flavor is lost. That said, I recommend buying corn from a farmers market for the freshest corn possible. If you’re not going to eat it that day, pop it in the refrigerator to slow down the conversion. If you’re substituting fresh corn for canned, as a general rule, when you cut corn off the cob, you get about ½ a cup of corn. When cutting corn off the cob, a neat little trick is to place the cob in the hole of an angel food pan or Bundt cake pan and then scrape off the kernels so they fall into the pan without going all over the counter (Bundt works better because the hole is smaller). I saw this idea on Pinterest and it works beautifully. Microwaving corn is my favorite cooking method because it’s so simple and fast. Simply pop the entire corn in its husk in the microwave and cook on high for 3-3.5 minutes; two ears for 4-5 minutes; three ears for 5-6 minutes. Allow it to cool for 5-10 minutes before you shuck it. Another popular cooking method is to boil the corn. I always add a good dash of salt but also 1/3 cup of sugar to the water to bring out the sweetness. I particularly recommend this if you buy corn in the off season when it’s likely been shipped from far away and not as sweet. Boil corn for about 6-8 minutes. The older corn is, the longer it takes to cook because it’s starchier (add 1-2 minutes). If you’re working with a bunch of corn, don’t toss the cobs when you’re done. 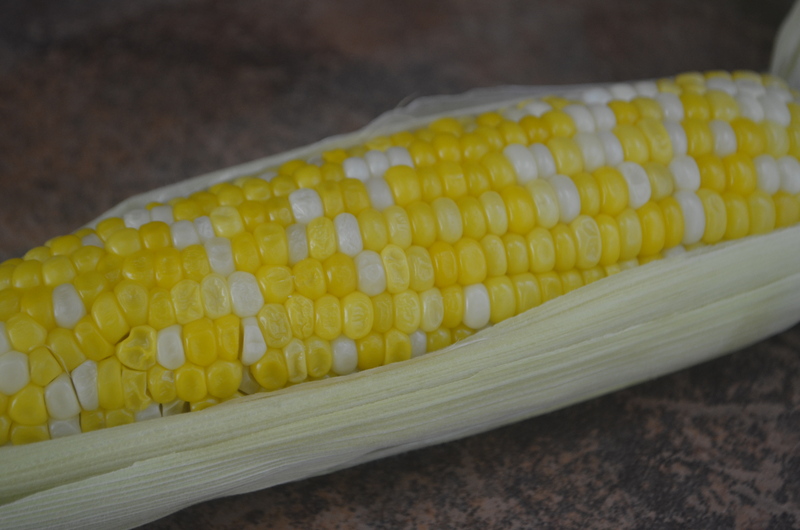 Corn cobs can be used to make wonderful corn stock and frozen for corn chowder this winter. I boil 8-10 cobs with 5 cups water, 2 cups chicken stock, a carrot, two celery stalks, 1 bay leaf, and one sliced onion. Boil for an hour and then cool and freeze it for corn chowder this winter. If you want to use it right away, you can use it in place of water when making rice, quinoa or risotto. That’s all the corn tips I have. I made this for my husband when we first met and it’s one of his favorite dishes to this day. This salad has celery, several types of bell pepper, red onion, parsley, basil and a light vinegar dressing. It’s so refreshing on a hot summer day and goes with everything from sausages to chicken to burgers. It’s perfect for picnics and potlucks. And is an easy side dish for rotisserie chicken. The great thing about this corn salad is you can substitute canned corn in the winter. For the dressing, whisk ingredients together in a small bowl and set aside. For the salad, cook corn according to your favorite method. If you’re microwaving, microwave on high in the husks for 5-6 minutes. 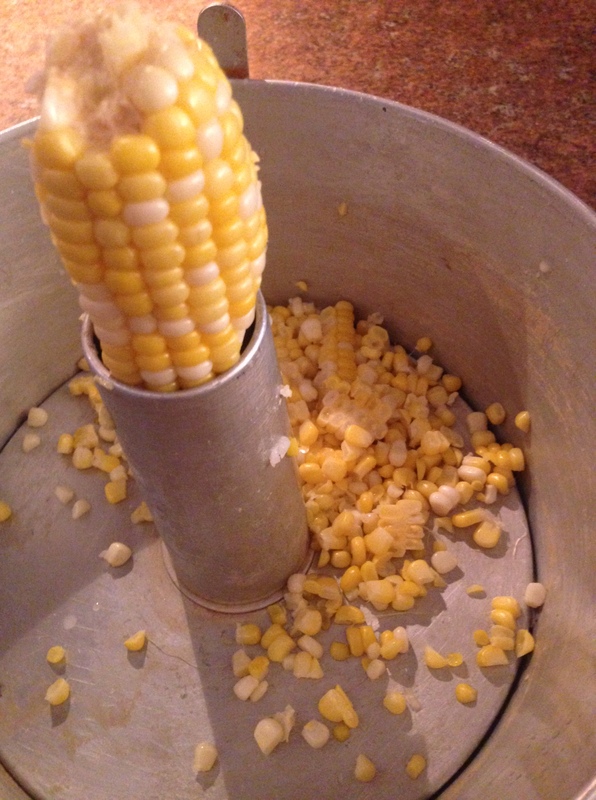 When cool enough to handle, remove husks and corn silks and cut corn off the cob and add to a large bowl. Chop all your vegetables and add to corn. Add chopped parsley and basil and toss the salad with dressing. Cover and refrigerate 2 hours before serving. Leftovers keep for days in the refrigerator. 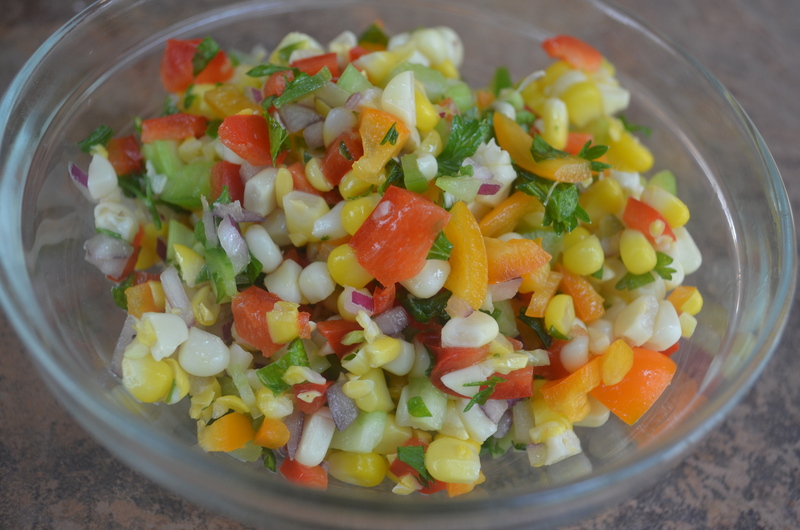 This entry was posted in Salad, side dish and tagged bell peppers, corn, corn on the cob, easy, healthy, light, parsley, picnic, potluck, recipe, refreshing, salad, side dish, summer on July 9, 2015 by Juliana Goodwin. This salad is incredible and comes together so quickly. It’s perfect for lunch or dinner on a hot summer night. It’s a restaurant quality salad on the table in less than 10 minutes. Kale is packed with vitamins K, A and C, (a serving has more than 800 percent of your daily vitamin K needs); walnuts have Omega 3 fatty acids, and the nuts and chicken give it protein to keep you full longer. However, sunflower seeds do add a lot of calories and fat, so if you’re watching your waistline, you may want to omit those and double up on strawberries. A sprinkle of goat cheese crumbles is great on this salad, too. If you can’t find baby kale, you can substitute spinach or arugula. I bought baby kale in a plastic tub next to other salad greens. It’s important to use honey roasted sunflower seeds as it adds sweetness. I used applewood smoked chicken, but that is not available at all stores, so regular is fine. I would stick with traditional and not use a lemon-pepper chicken. Dress this salad with your favorite raspberry vinaigrette. I used Walmart’s generic brand, Great Value, and it was awesome. Enjoy this healthy, EASY meal. Spread kale on a large plate. Top with all the other ingredients. Toss with vinaigrette and serve. I like this with a crisp white wine. 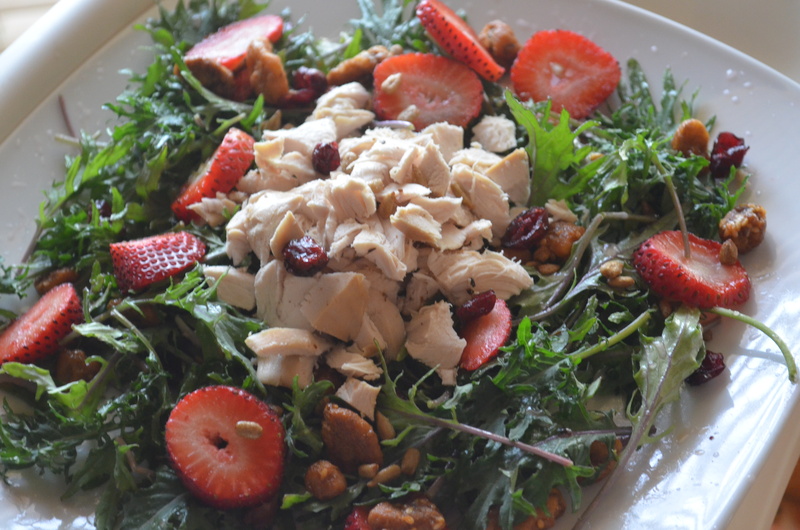 This entry was posted in 10 minute recipes, Healthy Recipes, Salad and tagged easy, healthy, kale, light, lunch, quick, rotisserie chicken, salad, serves 1, single serving, spring, strawberries, walnuts on March 14, 2015 by Juliana Goodwin. I am looking out the window and it’s gray outside today and going to snow later. What a perfect day for chowder. I adore this version of my chowder because it’s light. I use milk instead of heavy cream. It’s chicken, corn and potato. My daughter and husband both love it. Chop onion, celery, potato and set aside. I don’t peel the potato. Heat 2 tablespoons of oil in large pot over medium heat. When hot, add onions and celery and cook 2 minutes. Then add flour and cook 5 minutes. Add potato, salt, stock and bay leaf and bring to a boil for 5 minutes. Reduce heat to strong simmer and add milk and corn and cook about 12 minutes or until potatoes are just tender. Add chicken at the last minute just to heat through. The vegetables should still be slightly crunchy. This lighter version of chowder uses milk instead of half and half or cream but it’s still packed with flavor. It’s an excellent soup and easy to make. This entry was posted in Soups and tagged comfort food, corn, easy, light, rotisserie chicken, soup, supper, winter on January 11, 2015 by Juliana Goodwin.